Along with the supply-side reform and an industrial structure optimization process, China’s shipbuilding industry has also ushered in the opportunity for industrial upgrading. Driven by industry policies, ship type upgrades and industry consolidation, the development of the ship equipment industry is changing the structure and landscape of China’s shipbuilding industry. How should ship equipment enterprises grasp the opportunities brought by the industrial transformation and cope with increasingly fierce competition? Since 2000, China’s volume share in the global shipbuilding market has continued to increase with the help of low cost levels and industrial policy support. In recent years, China has surpassed Japan and South Korea in all three major shipbuilding indicators — orderbook, new orders and completions — becoming the world’s largest shipbuilder. 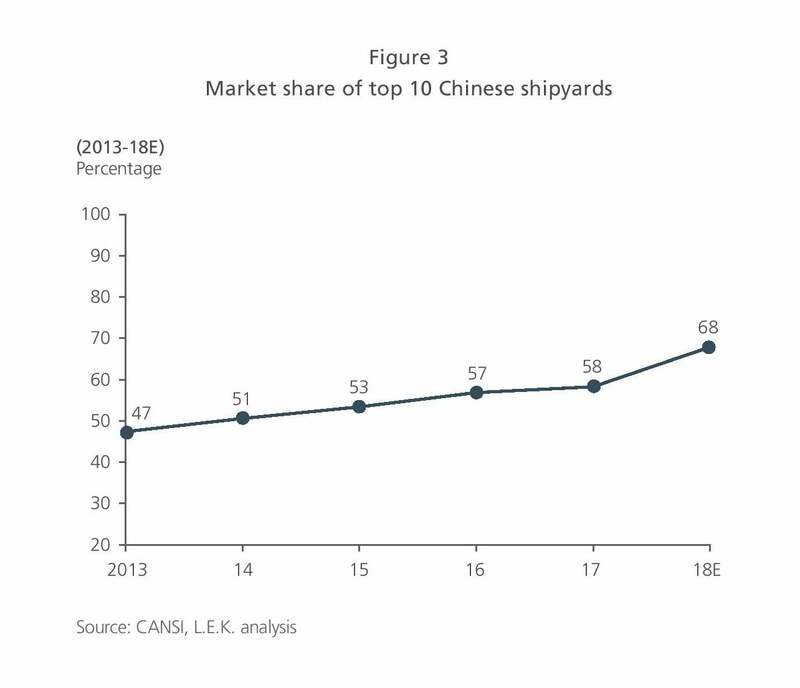 Four out of the top 10 global shipyards are Chinese companies, and those four Chinese yards account for 45% of the top 10 yards’ orderbook in total. Although the global shipbuilding industry has faced a prolonged cyclical business downturn leading to weak demand in the past few years, China still maintains a relatively stable share of the international market due to its cost and price advantages. China’s shipbuilding industry delivery volume will remain stable over the next few years. However, China has achieved only the one goal of becoming the largest shipbuilder; there is a considerable gap to close in order for China to become a strong shipbuilding country in terms of value and technology. China’s existing production capacity is still dominated by low value-added and low-tech ship types. The bulkers account for about 50% of the total delivery, and the three mainstream cargo vessels — bulker, tanker and containership — together account for more than 90%. Coupled with the sluggish demand caused by the cyclical downturn in the downstream shipping industry over the past few years, the overcapacity is serious in the low-end vessel production, especially in a large number of small and midsize private enterprises. On the other hand, high value-added ship types such as LNG, LPG, special engineering vessels, Ro-pax and luxury cruise vessels have shown insufficient capacity. In addition, compared with traditional shipbuilding powers such as Japan and South Korea, low industrial concentration level, weak design and R&D capabilities, low production efficiency, and a lagging ship equipment industry are also serious challenges for Chinese shipyards trying to gain a competitive edge in the global market. After decades of extensive development relying on the low-cost and capacity advantages, China’s shipbuilding industry now needs to transform and upgrade to a more refined way of development and focus on high-end vessel types to enhance global competitiveness and profitability. In recent years, the Chinese government has issued a series of guidance and action plans for the shipbuilding industry to provide supply-side reforms and accelerate the transformation and upgrading of the industry. “Made in China 2025” clarifies the overarching strategic objective to become a nation strong in high-end shipbuilding and offshore engineering equipment manufacturing. “Shipbuilding Industry Deepening Structural Adjustment, Accelerating Transformation and Upgrading Action Plan (2016-2020)” put forward by China Ministry of Industry and Information Technology (MIIT) proposes a series of plans such as eliminating low-end production capacity, increasing R&D investment, improving industry concentration level and efficiency, and achieving breakthrough in construction of large luxury cruise vessels. “The Ship Equipment Industry Capacity Improvement Action Plan” raises the objectives of completing the product spectrum and increasing the localization rate for the ship equipment and component industry. Driven by market demand and industrial policies, there are three major market trends we have observed emerging in China’s shipbuilding and ship equipment industries. In recent years, Chinese shipyards have taken actions to increase their R&D investment, strengthen their management system, and continuously optimize their product mix, achieving breakthroughs and progress in a series of high-end vessel types, including the 2,500-passenger luxury Ro-pax, 7,800-parking space Ro-Ro, 84,000-cubic-meter ultra-large LNG vessel, 38,800-ton duplex stainless steel chemical tanker, 20,000 TEU mega-containership, 350,000-ton FPSO, etc. China’s first high-profile luxury cruise project is also steadily progressing. In 2017, the China State Shipbuilding Corporation (CSSC) signed a memorandum of agreement with Carnival Corp. and Fincantieri S.p.A. to collaborate on the construction of China’s first luxury cruise ship. The cruise ship owner — the operating company formed by CSSC, Carnival and the China Investment Group — will order the first series of 2+4 133,500 GT Vista-class luxury cruise liners from the cruise-building company jointly established by CSSC and Fincantieri. Each cruise ship would cost $780 million and be built at Shanghai Waigaoqiao Shipyard, a subsidiary of CSSC. The project has entered the preliminary design and preparation phase, and the first ship is to be delivered in 2023. Due to the joint effects of market dynamics and policy guidance, the concentration level of China’s shipbuilding industry has increased through horizontal integration and by clearing out excess low-end capacity. At the end of 2016, China Ocean Shipping Group had merged 13 large shipyards and more than 20 supporting service companies to establish COSCO Shipping Heavy Industry Co., Ltd., and CSSC and CSIC are also actively integrating and restructuring their affiliated shipyards. In the first half of 2018, the market share of the top 10 Chinese yards was 67.9%, 9.6 percent higher than 2017 and nearly 20% higher than six years ago. As the industry concentration improves, the shipbuilding companies’ operational efficiencies and brand values will improve as well. Meanwhile, China’s large shipbuilding companies are also actively developing ship design, R&D and ship equipment capabilities, and carrying out vertical extension and integration to enhance their competitiveness and profitability. The ship equipment industry is an important part of the shipbuilding industry. Ship-specific equipment accounts for about 40% to 60% of the total ship cost, mainly including power systems, electronic and electrical equipment, deck machinery, and cabin machinery. From a value chain perspective, due to high technical barriers and concentration levels, the upstream ship equipment industry has a much higher gross margin level than the downstream shipbuilding and assembly activities have. At present, the high-end products and brands of the ship equipment manufacturing industry are still concentrated in Europe, especially in Norway, Finland and Germany. China’s ship equipment industry is still in its infancy with high import dependence. High-end diesel engines, propulsion systems, and communication and navigation equipment are areas with the most potential for domestic substitution. In recent years, in order to make up for this weakness and better serve the downstream shipbuilding industry, Chinese shipbuilding and ship equipment enterprises have continuously improved their capability in marine equipment manufacturing through technology introduction, global cooperation and independent R&D. Consequently, the localization rate in some critical equipment is also gradually increasing. In the field of power systems, domestic low-speed, medium-speed and high-speed diesel engines have achieved breakthroughs and gained market recognition. In the field of environmental protection equipment, Qingdao Shuangrui became the world’s first qualified supplier of marine desulfurization equipment to obtain IMO new G8 certification. And its BalClor ballast water management systems became the first type in Asia to receive USCG certification. Based on the above observations and analysis, we believe the Chinese shipbuilding industry, which is large in scale and undergoing transformation and upgrading, has created new opportunities for ship equipment companies and investors. The industrial transformation and upgrades have brought out more opportunities for high-end ship equipment to penetrate. 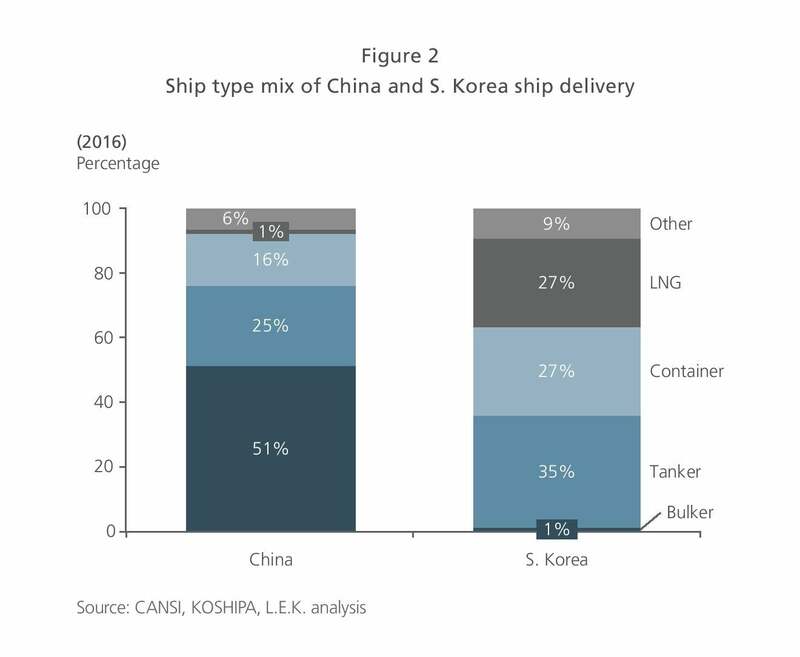 With the transformation of China’s shipbuilding industry, the future upgrade of product mix to more high-value-added ship types (luxury cruises, LNG/LPG, etc.) will bring incremental demand for high-end marine equipment. Multi-national ship equipment companies can secure key accounts and gain first-mover advantage by leveraging their technological advantages and relationships with global shipowners. At the same time, they can deploy and develop distribution networks to strengthen their customer relationship management with local large shipyards. A local procurement, OEM or other viable localization plan would reduce cost and improve price competitiveness of the products. Local ship equipment companies would need to keep enhancing R&D capability to overcome the technical barriers and catch up with global leading players to meet the demands in higher-end vessel types. They must expand market share by leveraging the advantages in customer relationships with local shipyards as well as in cost levels, cooperate with local key accounts in the global market, and last, but not least, proactively expand the overseas market by building up relationships with global shipowners. The cyclical downturn of the shipbuilding industry has created more M&A opportunities. High-performing companies and investors could consider acquiring and restructuring bankrupt companies or high-quality small and medium enterprises at a lower price during the downturn of the industry to benefit from the synergies in product mix, customer bases and channels, and expanding market share and industry influence. Where will the future growth of China’s marine equipment market come from? What kind of organizational structure and business processes are needed to adapt to a rapidly changing market environment? What are the customers’ real needs and key purchasing criteria? What is the procurement process for marine equipment? Who is the decision-maker and who is the influencer? What product portfolio can achieve maximum synergy and bundling effects? How can distribution networks be designed and deployed to cope with the highly fragmented market and strict market entry barriers? MNC companies should also consider how to compete with the local players. If localization is needed, then what is the best model? How can the proprietary know-how and brand value be protected in the localization process? At the same time, we also recommend that companies and investors continue to pay attention to potential risks and prepare for contingency plans accordingly. Major risks may include fluctuations in the industry’s macrocycle, an increase in the regulatory entry barrier for foreign companies to enter, the escalation of global trade friction, and the risk that local competitors would gain core technological breakthroughs and thus form a competitive advantage. Fast-Moving EV Battery Market: How to Win Against the Competition?